We support THE ME TOO MOVEMENT! For fans of How to Babysit a Grandpa comes a tongue-in-cheek story that is a step-by-step manual for putting your monster to bed. If you have a monster that won’t go to bed, don’t bother asking your parents to help. They know a lot about putting kids to bed, but nothing about putting monsters to bed. It’s not their fault; they’re just not good at it. Read this book instead. 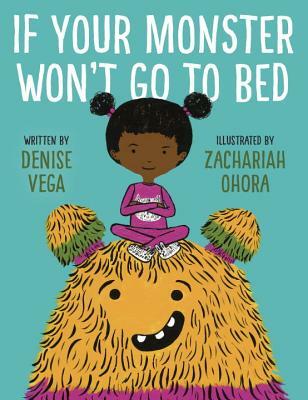 It will tell you what to feed your monster before bed (it’s not warm milk), and what to sing to your monster (it’s not a soothing lullaby), and what to read to your monster to send him off to dreamland in no time (the scarier, the better). Just make sure you don’t get too good at putting monsters to bed—or you might have a BIG problem on your hands! DENISE VEGA is the author of several books for young readers, including Click Here (To Find Out How I Survived Seventh Grade), Fact of Life #31, Build a Burrito, Access Denied, and Rock On. She lives in Colorado with her family. Find her online at denisevega.com. ZACHARIAH OHORA is an award-winning illustrator and children’s book author. His work has appeared in numerous publications, including the New York Times, the Atlantic, and Bloomberg Businessweek, as well as on NPR. He is the author-illustrator of My Cousin Momo; No Fits, Nilson! ; and Stop Snoring, Bernard! and is the illustrator of Wolfie the Bunny by Ame Dyckman and The Pet Project by Lisa Wheeler. Find out more at zohora.com and @ZachariahOHora. Interviewing Chris Ferrie was a joy since we have great respect for his endeavors promoting science, and we feel that his board books on science topics for children are unique. They are messages not only for children but for adults as well. They can make adults comfortable introducing deep scientific concepts to children, and, with enthusiasm, can impart basic understanding of those concepts and inspire curiosity. Chris’s books are beautiful and well executed. We are happy to carry them on our shelves. Chris Ferrie: I am Chris Ferrie. I live in Sydney, Australia with my partner and our four children. I am a professor of quantum science at the University of Technology Sydney (UTS). I have previously worked at the University of New Mexico and, prior to that, obtained my PhD in Mathematical Physics from the University of Waterloo in Canada. I started writing children’s books in 2014 with Quantum Physics for Babies. It was self-published for several years and recently all of my books are now published by Sourcebooks (Chicago). 32nd Avenue Books: Can you describe the process you used to separate the information into the three levels of learning and do you feel that there are specific ages appropriate for those levels? captures the essence of how the illustration relates to the concept. Finally, I reword the description, reducing the complexity of the sentences and number of syllables as much as possible. Of course, there is much editing to do after this. But this is the basic approach to arrive at a working draft. I don't like to think of each level in terms of a specific age. There is a natural progression and I think parents can easily gauge the interest of their children. A child’s interest also ebbs and flows. Sometimes my youngest (17 months) will pause on a page and I will read beyond the initial level, even though it seems to be more advanced. 32nd Avenue Books: Your books introduce children to scientific principles. How do they inspire curiosity? Chris Ferrie: My board books are designed to be read by parents (or teachers) to young children. I don’t expect the content of the books to inspire curiosity on their own. That must come from the dynamics of the interaction with the parents. The books are a tool for parents and teachers to help inspire curiosity and questions and I hope that I have built them well for that purpose. 32nd Avenue Books: What can you say about structuring an illustration so that it will accommodate every level? Chris Ferrie: In most cases, this was quite natural. The illustration comes first. So the description is tailored to illustration. I think this is important because the eyes are drawn to the illustration first, no matter what level you are at. As for the illustration itself, the mantra is: simplicity for all levels. Even in my academic work, when I am creating figures for expert audiences, I still attempt to make it as simple as possible. You can build complexity on top of simplicity if you have sufficient understanding. So there is something to be gained by everyone with simple illustrations. 32nd Avenue Books: Can you describe any difficulties you encountered creating scientific non-fiction for children? Chris Ferrie: I think the only difficulty was in my own confidence. But once I decided to jump in, it was quite easy. I created these books for my own children and so it was easy for me to validate whether I was doing a good job for that purpose. I get the impression that many think it would be difficult to convince a child to pick up a book on quantum physics. But this is not true, not unless you tell them that it is supposed to be difficult for them. Children see all books equally—they have pictures and words and someone is going to read it to me, yay! 32nd Avenue Books: Do you have any advice for parents or teachers on how to use your books? Chris Ferrie: Enthusiasm. Enthusiasm. Enthusiasm! Many people I talk to are very discouraged about math and science. Those feelings are very easily impressed upon children. So, find your inner scientist, and model the curiosity you want your children to have about the world. The other piece of advice is to internalize the idea that science is not about learning a bunch of facts. It’s a method to find good answers to interesting questions. What is written in my books are not facts. What is shown in my books are ideas to be build upon. Questions are supposed to be asked and good questions don’t necessarily have short and correct answers. Good questions are the beginning of journey!